Hi My Fellow Viti Friends ;)! 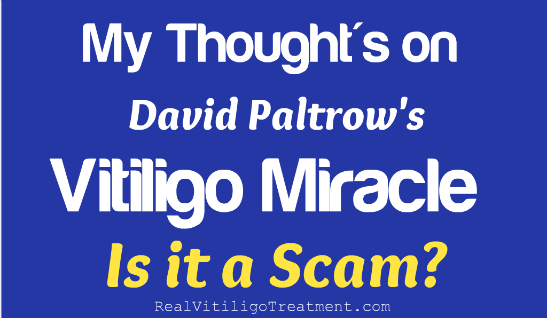 The other day I bought David Paltrow’s Vitiligo Miracle. I bought it because I was intrigued, and I wanted to see if anything he had to say made sense or if it was just a scam. I felt really scammed when I bought Michael Dawson’s vitiligo book. He kept promising a “system” throughout the sales page, but when I opened the book I couldn’t find this so-called system anywhere. It was just a bunch of basic information about what vitiligo is, suspected causes, common medical and natural treatments, blah, blah, blah…YAWN. Basically not helpful at all. At least to me it wasn’t. So when I came across David Paltrow’s book, my initial thought was, “It’s probably a rip-off like the other book”. But, upon further inspection of the sales page, something told me that The Vitiligo Miracle would be different. First, I will tell you what my first impression was based on the sales page, and what I thought of the book after quickly scanning through it. Truthfully, I got both good and bad feelings from the sales page. The first thing that jumped out at me were the claims of reversing your vitiligo in as little as 7 days, which we all know is not possible for the great majority of us. However, I will say that when I had my phone consultation with Dr. Wanakee Hill, she told me that she could rub some crushed vitamins on her white spots at night and the next morning she would have some little spots of pigment returning. So, I say that to say that it may be possible to get fast results for some people, but highly unlikely. The other thing I didn’t like was the constant use of words and phrases such as, “The only holistic system in existence”, and “No one else will tell you about”, “Miracle”, etc. These phrases felt exaggerated and insincere to me, and really just play upon the panicky desperate feelings we have all felt about our vitiligo at one time or another. I prefer straight logic without all of the hype. Totally unnecessary in my opinion. I also tend to really dislike upsells…and there are two of them, $17 each. However, both could be helpful depending on your situation…although you can purchase the eBook without them and you won’t have to feel like you’re missing out on something important. One upsell is a cookbook, which may or may not be helpful to you. I personally love cookbooks. They were especially helpful to me when I first started significantly changing the way that I ate. When you are trying to avoid gluten, nightshades, sugar, etc. you tend to not know what to eat. Cookbooks are a lifesaver. Since I already have a million cookbooks though, I passed. The other upsell is a candida book. I also have two candida books, so I didn’t need this one either. But again, you may feel you could benefit from it. There are also a bunch of so-called “testimonials”, and I’m never really sure if these things are real or not. So I didn’t really give them much credence, and skipped over them. But I still kept reading to see if there was anything worth my attention. And, of course, I was pleasantly surprised. Several of the best anti-Vitiligo supplements that almost NOBODY knows about, compiled by a 12-year study. SECRET #18: WARNING! 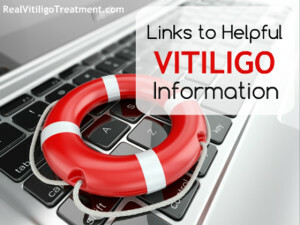 A very common household ingredient can aggravate your Vitiligo. If you do not get rid of it, you will never get rid of your Vitiligo. So at this point, I am thinking this guy probably knows his stuff. What really sold me on The Vitiligo Miracle was the fact that he kept mentioning a step-by-step system. This is what I was most interested in. Sure, it could be argued that many of the things he discusses in this book can be found on the internet for free, or perhaps after a few trips to the library. However, it is VERY time consuming to not only find all of this information, but then to make sense of it all, and then put it all together into some sort of workable plan…I say this from experience. There were many times when I felt like I had so many things swirling around in my head that I didn’t know where to start. Having all of the research done for you and put it into an organized format, made this book worth every penny in my opinion. The Table of Contents is clickable, which is really nice-so you can quickly skip around to find the information you are looking for. LOTS of information, and all appears to be very accurate. Appendix contains a 7 day sample menu and some recipes, I really like this. In part 2 of my Vitiligo Miracle Review, I will cover chapters 1 and 2. So stay tuned if you’re interested in hearing about them :)! P.S. The links in this post are affiliate links, which means I earn a small commission if you decide to purchase this book through my links. This helps me pay for the cost of this blog so that I can continue writing it for you. I’m telling you about Vitiligo Miracle because it is an excellent book about vitiligo and it contains most of the treatments that I’m currently using right now to reverse my vitiligo. Thank you for your support ! I have bought this ebook and today my son 8yrs old starts with 3days fast cleaning juicing fruits and vegetable. I dont know if has any risk 3 day juicing for a child???? Please have you any idea? Hi, thanks for the review you had posted for the vitiligo miracle e-book. I have tried to purchase that book through your website several times but was not successful. Is the book still for sale. Thanks a lot for having created this blog! Thanks for visiting the blog, and I am so glad you like it! So what is your final impression for this book? Is it worth buying or just another scam? It is definitely worth buying if you are newly diagnosed and trying to figure out what to do. If you already have a very good understanding of autoimmune disease and its underlying causes, you can skip it. Hi Have you heard about the “8 -Body type” treatment developed by Korean doctors? This is something new that I just found, haven’t tried it yet but it makes sense to me..it is the inner balance, what you eat and how you live your life. Hi there, my 8 yrs old son have been having it for 4 yrs. What i am missing by now is your personal experience. Have u been practicing the book above. Any improvements? 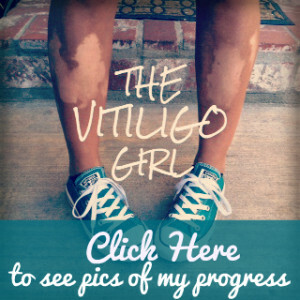 Progress with your vitiligo? Yes I do follow the book above – but what I also do Nutritional Balancing, which is pretty much the same thing. You can see some of my progress here http://realvitiligotreatment.com/vitiligo-natural-treatment-repigmentation-update/. I will also be posting more of my progress soon, as I have some repigmentation starting on my shins. Slowly but surely…Thanks for visiting! Please stop believing these lies. please be honest with your self. I have vitiligo too and I know what is the truth now. You have no idea how insidious and cunning these scumbags are who create these marketing videos, its all BS. the near entire medical profession is made up of ignorant fools who have learned BS in their schools. the real medical journals and truths have been buried. there is no money in the cure. they dont care. as helpful and practical as some of the advice can be it will never cure vitiligo. You have vitiligo because there is a problem in your gut!! all disorders start in the GUT. you dont have a skin prblem you have a problem in your GUT. and im not talking about H. Pylori if youre familiar though it is a relative theory. Thanks for stopping by the blog! I agree with you about the medical profession and the fact that there is no cure because it isn’t profitable. However, I do not agree that this eBook is a bunch of lies. In fact, the reason I chose to review it is because of all of the hype surrounding it – I wanted to see if it is worth reading, but more importantly, whether or not it would be truly helpful to someone trying to reverse his or her vitiligo. You are right about the gut – problems in the gut are shown to be associated with vitiligo. I actually wrote about it here: http://realvitiligotreatment.com/low-stomach-acid-vitiligo-need-know/. But there are other issues that must be considered as well. Personally, my vitiligo continued to spread despite focusing heavily on rebuilding my gut for the better part of a year. For me, I believe it was my severe adrenal fatigue that was/is causing my low stomach acid…which is why only addressing my gut wasn’t quite enough. I am currently focusing on rebuilding my adrenal/thyroid function as well as detoxing heavy metals. This comment is so hurtful. The purpose of a Blog and commenting is to encourage others that are in serious need of help. I am the mother of an 11 year old little girl who just got done reading your post. She came to me in tears saying mommy what does this mean. I’m sure there are more like you out there…. but you need to consider your audience. When I’ve spent all this time encouraging her trying to build her confidence and ensure her that I am Desperately Seeking results. So if you’re going to put something like that on a board like this you need to back it up with what actually does work. Save your negative comments if you have to go that far and be hateful about it.